Today’s submariners paid their respects to some of their bravest wartime forebears in a remote part of Scotland. Veterans of midget submarines were guests of honour at a service next to Loch Cairnbawn, from where 70 years ago X-craft sailed to cripple Hitler’s flagship, the Tirpitz. 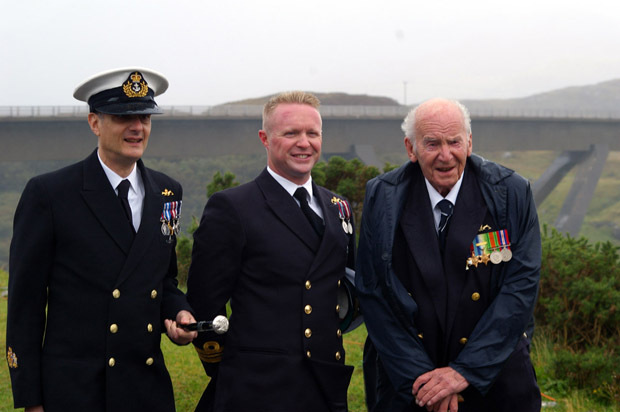 On a cold, wet and windy day in one of the remotest spots in the British Isles, veterans joined current submariners, family members, dignitaries and historians to pay tribute to one of the greatest deeds in the annals of the Silent Service. Seven decades ago this September a handful of midget submarines set out to cripple the pride of Hitler’s Navy, the Tirpitz – the largest battleship in the Western World. In a raid which was later immortalised on film, half a dozen four-man submarines – known as X-craft – were dispatched to lay explosive charges under the leviathan. Only three reached the beast in its lair in Altafjord, east of Tromsø, but they succeeded; Tirpitz was knocked out of action for six months. In HMS X6 on that raid – Operation Source – was Lt John Lorimer. Now in his 90s, and a retired commander he was one of two X-craft veterans who were guests of honour at the 70th anniversary service honouring the men of the Twelfth Submarine Squadron. He was joined by his former colleague Sub Lt Adam Bergius who took part in missions against the Japanese in the Far East. Both men were decorated for their deeds in these 30-tonne craft – the DSO for Mr Lorimer, the DSC for Mr Bergius. And both men trained in the sheltered waters of Loch Cairnbawn, about two dozen miles north of Ullapool on the north-west coast of Scotland. And it is overlooking those same waters that a memorial to all who served in those midget submarines and chariots (human torpedoes) between 1942 and 1945 stands. Despite the remoteness of the monument, nearly 150 people made the pilgrimage to honour the X-craft pioneers – 39 of whom made the ultimate sacrifice in missions against the Axis powers. As the wind gusted and the rain lashed, Jonathan Brett Young, Deputy Lieutenant of Sutherland and a former naval officer, thanked those gathered for making the effort, before author Paul Watkins read extracts from his biography of Godfrey Place, awarded the VC for his part in the Tirpitz raid with Mr Place’s children Melanie and Charles listening. The Rev Peter Mosley performed the service of remembrance and after the strains of the Naval Hymn faded over the loch, the haunting notes of the Last Post were sounded by Royal Marines Bugler James Trowbridge. Maj Gen Patrick Marriott, Deputy Lieutenant of Sutherland, closed proceedings. Despite his firm Army background, the general admitting having a soft spot for the Senior Service, as both his parents had served in the RN; indeed, his father commanded two wartime submarines – including HMS Graph, formerly U570, which was captured and put into service under the White Ensign. Today’s RN was represented at the service by Command Warrant Officer Submarines WO1 Stefano Mannucci, WO1 Bob Morrison and WO1 David Annan from the Faslane Flotilla, and HMS Sutherland’s Lt Cdr Chris Morgan. “It was a great celebration of a fantastic achievement and a fitting tribute to those from the 39 men of the Twelfth Flotilla who made the ultimate sacrifice for their country in operations – and during the hazardous training,” said WO Morrison. As for Operation Source, six X-craft were towed by ‘mother’ submarines across the North Sea. X9 was lost on the way across and X8 was damaged and had to be scuttled, leaving only four small boats to carry out the mission. X10 was due to attack the battle-cruiser Scharnhorst, but the ship had sailed on exercises so the mission was aborted. For the remaining three craft attacking Tirpitz, they had to get past a screen of anti-submarine vessels, anti-torpedo nets and anti-submarine nets before finally laying their charges. X5 was blown out of the water by the German battleship’s guns before she could lay her charges, but X6 and X7 did. Their crews were unable to escape, abandoned their boats and were taken prisoner. The operation cost nine British lives, but the blast caused extensive damage both to Tirpitz’s hull – she shipped over 1,400 tonnes of water – and one of her 15in gun turrets was dislodged. Tirpitz was out of action until April 1944 – and then the Fleet Air Arm knocked her out for a further two months in a carrier-launched strike. The battleship was finally sunk by the RAF in November 1944 using 12,000lb ‘earthquake’ bombs which caused Tirpitz to capsize. Photo courtesy of Navy News: WO1 Stefano Mannucci, Command Warrant Officer Submarines, Lt Cdr Chris Morgan, representing HMS Sutherland, and Cdr John Lorimer DSO, veteran of the Tirpitz raid with the Kylesku Bridge behind them.